To begin, follow the steps below to find services to meet your needs. Not sure what kind of help you are looking for? Call the 24/7 helpline 2-1-1 and a Community Navigator will be happy to help you. Option 1: Are you in Crisis? Do you need to talk to someone right now? Call the Mental Health Crisis Line at 705-728-5044 or 1-888-893-8333. Some Family Doctors have their own mental health and addiction counsellors at their Family Health Team. Ask your doctor if they are a member of a Family Health Team. If you do not have a Family Doctor, click here to access Health Care Connect. If you feel you just need to talk to someone, free, single session walk-in counselling is available throughout the region. No appointments are needed. Click on the calendar tab below or search the directory to find available locations, dates and times. The Common Point directory contains resources SPECIFICALLY for mental health and addiction services available to children, youth and adults in North Simcoe Muskoka. 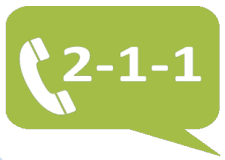 211 is a free, 24/7 hotline that helps people connect to community, social, health and government services in their communities. To support this work Community Connection/211 maintains a comprehensive database with their partners nsmhealthline.ca, Contact South Simcoe, Information Barrie, Information Orillia, and Community Reach North Simcoe.